A super creative mind. A humble person and a passionate filmmaker. Harish Nagaraj is all of these and more. We had the opportunity to talk to him, about his journey thus far and his future exciting projects. 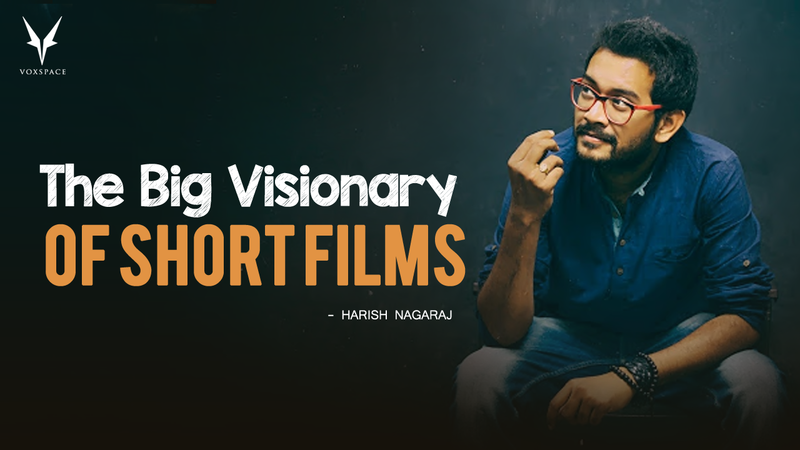 So let’s see what Harish Nagaraj, one of the most successful short filmmakers in our industry today has to share with us, regarding, Love, Life, And Everything Between Them…. 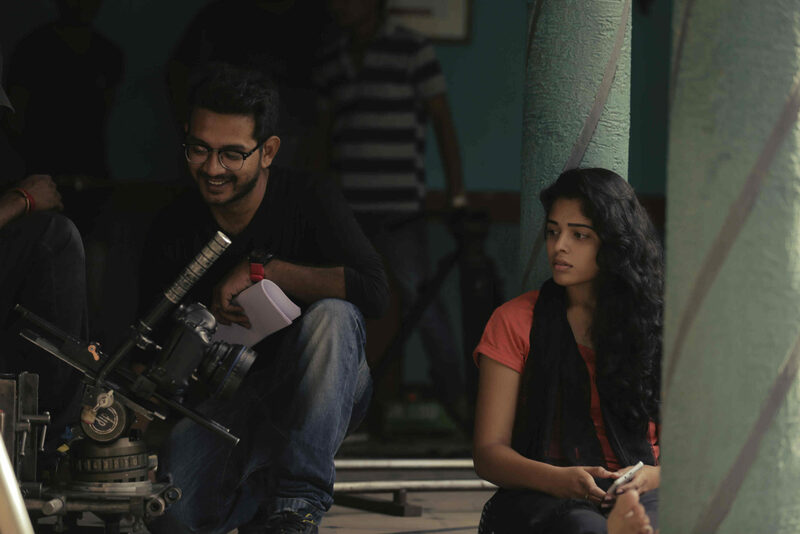 Where does the journey of Harish as a filmmaker start? What was the point in your life where you decided to take up this career? First of all, I want to applaud VoxSpace crew for their fantastic job, in encouraging aspirants from every field, and their honest intentions towards bringing our stories to the people. It’s a great pleasure to have such a team in the existing competitive space. As for me, I was initially a dancer and took up choreography for many songs until I completed my graduation in Chennai. In doing so, I used to visualize any song I liked and would start putting in my steps for it. After some time I stopped watching the actual visuals of the song altogether and used to compose something entirely different. My passion for Dance continues even today. Apart from that, I love Music too. Music always takes the front seat in my life. Most of my stories, ideas and thoughts, take form when I visualize them in the music I hear. Perhaps, these are the two factors which helped me take up direction somewhere. My family hails from Guntur. During our childhood, all of my friend’s circle, used to visit orphanages and nursing homes and contribute what we could to them. That’s when I started interacting with them and even taking care of them. I guess, that’s when I started listening to their stories. This experience changed the way I saw the world we live in. I was poor at my education but was always the first one to take up any creative tasks at school. My failing graphs prompted my father to put me in a hostel, although my home was hardly fifteen minutes away. At this point, a sort of loneliness and confusion stirred up in my life. I began thinking about things I could do in the creative field. Time passed, and I ended up in Chennai, pursuing my B.Pharmacy course. Chennai shattered my dreams of starting a career in the film industry. Although, the city gave me a great friend in college and for that I’m grateful. While there, I also made a short film regarding ‘Stop Using Tobacco Survey’ happening in my college with the help of my brother, Sukruth Poojari. My filmmaking ideas started from writing poems. I wrote thousands of them, basing on everything that Interested me. All these things, made me realize that this was my life. I had found a purpose; that was to create stories and thoughts in a visual manner. Hence, after graduation, I left home to follow my dream of filmmaking. However, my family initially did not encourage my decision. It took them a while to understand my passion. I developed a habit of observing everything around me and make stories visually which could explain what I saw. That’s how my stories come out till date. Of course, I’ve had the continuous support of my friends Kiran Chakravarthula, Mounika Monas, Amat Srinivas and my younger brother Sandeep, in this establishing my name in the industry. I can’t thank them enough. Coming to your personal life, not many know much about you? Where do you hail from and as most of your videos revolve around Love stories, what exactly was your love story like? Now this is an interesting question. To be honest, I never got a chance to express my story through my films. Although, I’ve always been asked by my audience as to who my muse was. The question ‘Who are you dedicating this love story to’ has always been a natural question. Somehow, I never found the occasion to divulge much. I guess, this a good time to actually put out my story through this article. To start off, I’ve seen many hurdles in my life, many sad moments which I rather not go back to. To be true, because of my limited education, I never had the confidence to approach people and perhaps even think of a relationship. This is one of the reasons why I never really had a great relationship to talk about. I always had a hope that one day I’d find someone who would make me the happiest person alive. As time passed and I started making a name for myself, I did find someone who I admired and wanted to spend the rest of my life with. Coming to the story, well, it starts with Facebook. It was some a year ago that I met someone fascinating on Facebook. This person was someone I could see my life with. Obviously, as days passed, We got in touch, and I confessed what I felt about her on June 3rd last year. I even went to the extent of asking her to marry me as well. Well, I was at a stage where I wanted someone in my life for good. Unfortunately, though, She wasn’t up for any commitment at that point in time. We remained friends later on, but as they say, the feelings never truly die. I still saw her as someone who could fulfill my life and dreams. Someone who could make me complete. Allthough, she never gave me a reason as to why she was unwilling to commit, she started avoiding me as time passed. My feelings got totally crushed out when I came to know that she was already in a relationship and that she had hidden that fact from me. That was one of the most devastating moments of my life, which tore, my soul and trust system, apart. Life came to a standstill, as I could not just go back to not loving her, and yet I couldn’t wait anymore. This was the person, whom I deeply loved and nothing could change that. Perhaps, that’s what made it all the more difficult. It was at this time that I slipped into depression. I was hurt all through my life, but this was a whole new level of pain. I couldn’t get her out of my mind and found about ways to see what she was up to. Updates, Posts, Mutual friends, anything that brought me an inch closer to her. It was, I think after I saw that she was still happy, and I was irrelevant in her scheme of things, that I felt the first tinge of hatred for her. Eventually, I became numb to the world around me and started focusing on things which mattered to me career wise. Now then, as fate would have it, I crossed paths with her again owing to my work pursuits. I started spending time with her daily, for four months during one of my projects. And for those four months, I was hurting badly in my heart. I just took to being formal and nice to her, keeping my feelings at bay. I for one, just arrived at a conclusion, that sometimes it’s just easier to lie yourself to happiness. Presently, though I’m looking forward to achieving greater success in my career, beyond anyone and anything affecting me. When I look back at these moments, I realize that if ever there was a turning point, a twist in my story, those were it. Today, I only have best regards for this person. I sincerely hope that she gets all the success in the world. As for me, well, somewhere the whole thing was my mistake. Perhaps, I was at a stage where I was reaching out way more than what life was ready to give me. That’s that, I guess. You’ve worked with many talented people in your career, who went on to establish their fandom. We’re curious, though, who amongst them would you pick if you were to make a movie and why? I always believe that everyone who I worked with, is an essential part of the success of my films. If given a chance to make a movie, I’d probably want every one of them to be a part of my project. However, If I have to pick a name, I guess I’ll go with Manoj ( who acted in one of my features, IDLY ). He and I are close to each other, and I’d want him on the first go. He is one actor who is immensely talented and spontaneous. Also, he has this knack of bringing something unexpected to the table in every scene. On that note, The lead pair of IDLY, has always been my favorites. Given the fact that Short Films and Web Series are the latest trends going forward, how do you believe the scene has changed in the past five years. What was the situation like when you just started your career as compared to now? To be honest, The short film culture was already existing by the time I started thinking of my career. Allthough, most of the times, you just want to stick to mainstream cinema, and I was trying for the same. However, in the last 3 to 4 years, the culture of short films, grew immensely. Suddenly, the online digital media became the hero. I think, it’s only going to grow in time to come. So much so that, I’ve even started advising People whom I met, to start investing in Web series if they have the resources for it. That to me is the future. Personally, each and every short film I’ve done until today has been a learning step for me, leading up to greater projects. It’s not easy to get some trust and admiration from the audience. Though, once you get it, it becomes a great responsibility to maintain them. Hence, we struggle, a lot, to write something great every single time, and increase the quality with every project. My happiness lies in get daily messages and comments from people about my stories. People connect and that’s a beautiful feeling. Your biggest hit till date, is perhaps “Parichayam.” What was the most significant factor in it for its huge success? Also, with this video you practically established Pujitha Ponnada and Arjun Kalyan as household names in Shortfilms. Now, how did you come to cast them? It’s an interesting story. I met both of them through Manoj, at a small gathering. Incidentally, At that time I was just about writing the concept, and upon meeting them, I had a feeling that Pujitha and Arjun would be aptly suitable for my script. I’ve always been very particular about the people I cast in my films, and hence I fixated on them and no one else. Both of them saw my earlier works eventually, and were impressed by my writing, and agreed to be a part of “Parichayam.” Fun Fact: I recently met Sukumar garu, and he complimented me on my project by saying “Nee Parichayam Chusi I Cast Pujitha in my Ad film” ( “I’d cast Pujitha in my Ad after I watched your Short film ‘Parichayam'”). It was an incredibly inspiring thing for him to say that. That compliment is something I can never forget. Also, I sincerely appreciate Pujitha and Arjun, for being a part of this project. I mean, to manage a professional job that they do, as well as, to take the time to act in wonderful projects, is something I truly admire in them. In this highly competitive market of media houses, web series and stuff, we’d like to know from you, if independent filmmakers like yourself, are given the complete creative freedom to their projects. What is the one thing that you regret not doing in any of your projects? Whatever the project may be, I believe that creative people must be respected for their work, since it’s their thoughts which make the YouTube channels trending, and rake in high ranks for the concerned websites. They give you the edge in the present competition. Most of the media houses, look for the returns rather than focusing on the content. This mindset needs to change. It’s the ideas and stories that count at the end of the day. No other jazz matters. It’s the creative minds who should drive the media houses forward, rather than vice versa. Here I’d like throw in some advice to all my fellow filmmakers and story writers. I’d suggest that they clearly understand the IVR rules, and guidelines, before signing up with contracts or legal agreements for media houses and channels. To safeguard your intellectual and creative rights is crucial these days. Be very careful when you take your ideas to people. Always better to be safe, than sorry. There’s no point if you have no rights on the things you create. 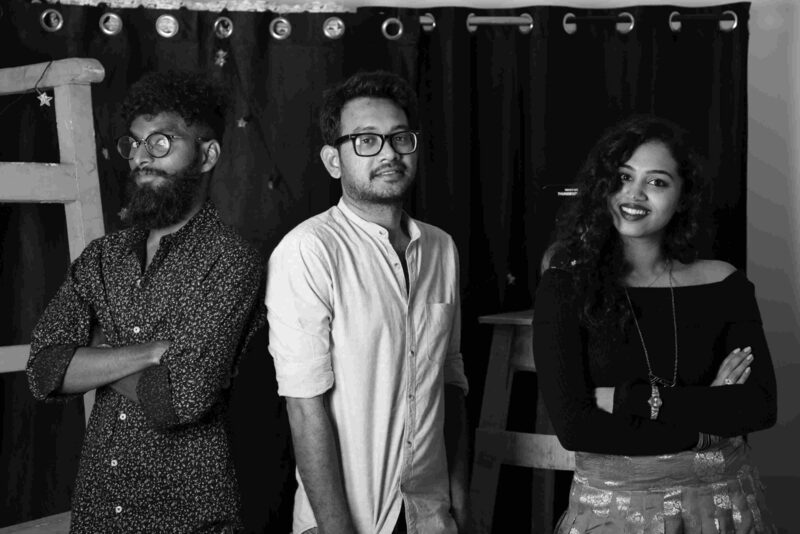 You recently directed the Tollywood MashUp Video featuring Manisha Eerabathini, which went to be a sensational project. Walk us through the journey for it. Any more MashUp’s coming up soon? Manisha is one of the most amazing people that I’ve met in my career. The perfect culmination of an incredible voice, intelligence, super dedication and passion, are just a few things that I truly admire in her. Honestly, I don’t usually interact with many people. Never been a socially active person, you know. But then, there was something about Manisha, which made me sit up and take notice. Once I got in touch with her, I instantly knew that she was someone I could discuss my ideas with and even collaborate on some. And as it were, the eventual mashup we did, came out with flying colors. It just goes on to show that, if you are sincere about what you do and willing to put in the hard work, the results will automatically come. Success follows. Hope to collaborate with her on some wonderful projects in time to come. Right now, under CinemaActivity, we are looking at some exciting projects with Sri Krishna garu and Malavika garu, in association with Band 7. Fingers crossed. Recently, You’ve established your production company “CinemaActivity.” Tell us more about it? What are its visions and missions going forward? And what makes it different from other media houses perhaps? Cinema Activity was started by me a year ago by putting in all my savings. With the help of a friend of mine, Bhuvanesh, we got a working space for the firm. 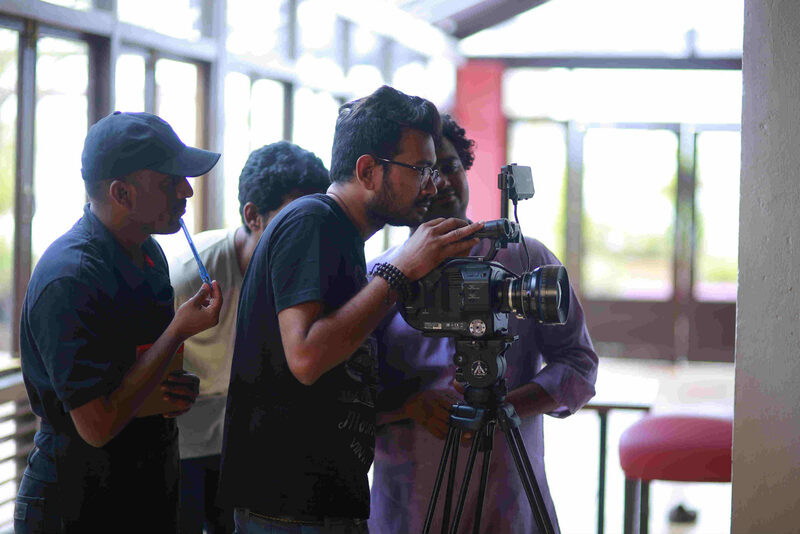 The main idea behind this is to help people who are trying to make a mark in short films and feature films. We get the movie aspirants in touch with the resources towards, casting, locations, crew, and post production facilities etc. At present, we are inviting YouTube producers to collaborate with us, for some exciting projects. We are looking to provide the resources to bring out creatively challenging projects. Thankfully, I’ve got a great team to fall back on, in the photography department. A shout out to, Chavalla Sai (Owner, Creativesnapix) who will be collaborating with us in coming out with greater projects in future. After being in the industry for a considerable amount of time and so much good work to your name, where do you see yourself in the next year or so? Also, any new and exciting projects that we should keep a look out for? Any new web series or any plans to revive your ‘Mahathalli-Mahanubhavudu’ series? I do have multiple things in mind, but I haven’t decided on anything yet. I’ve been waiting for long time to foray into mainstream cinema, but I’ve been apprehensive about it. I still have to find that push, I guess. So, right now, I’m in between projects, and I’m sure, something good will come out soon. ‘Mahatalli Mahanubhavudu’ was yet another great experience. One of my good friend, Karthik Sabareesh, encouraged me to take up something witty and interesting at that point, and that’s how it all started. Thereform, I pitched the idea, and one of the popular websites, Wirally South picked it up. 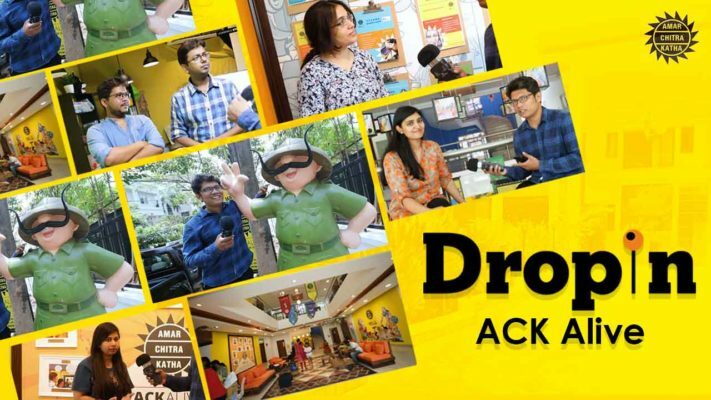 They took care of all the different aspects of making and promoting the web series in a perfect manner. I’m super happy that the leads Jahnavi Dasetty and RaviTeja have begun their own channels and are doing fabulous work. Mahathalli, the spin-off of the original series, is one the biggest properties in South India today. I feel proud to have started something, which has inspired people to come forward with high qualitative content in the YouTube space. Lastly, being one of the biggest names in Telugu short films, what would you advise people who want to make a mark in the industry? Could you suggest any do’s and don’ts for those just starting out in the industry? Dedication and hard work will get you what you want. Simple as that. I do think, I’ve not come to a position where I can advise people anything. After all, I am still at a stage where I am looking for advises improving my art. Honestly, I’ve still got many things to do, and this is just the start. A lot many things to prove. I think, the greatest teacher in our area of work is the work you take up. Experience and the focus to do better things is all the motivation you need. However, one suggestion I’d give out is never to take shortcuts. Never cheat or try to manipulate people to your advantage. Keep your eyes on your ambitions, and everything will fall into place. Be patient and put in your best. Money or revenue will come automatically. That’s the best mantra to do best in our industry. Lastly, Thanx a lot, Voxspace. Hope this year is yours. I loved your approach towards getting great stories to come online and the genuine support you give to creative people. Thank you so much. That was Harish Nagaraj, one of the most talented short filmmakers we have in Tollywood presently. Follow his works on his Facebook page, and never miss out on his upcoming projects.